[Episcopal News Service – Dover, New Hampshire] Few items hitch a ride with the Rev. Mark Pendleton through the entrance of the Strafford County Department of Corrections every Monday morning. More important are the words of hope and the friendly smile he transports to the dozens of immigrants locked away inside the jail. After leaving cellphone and wallet in his pickup truck and handing his driver’s license to the desk officer, Pendleton passes through the metal detector. On the other side he collects his keys, a Spanish-language Bible and an accordion folder filled with paperwork detailing past detainee visits and photocopies of legal pamphlets that may help some of the immigrants win release or halt deportation. At a time of deep divisions in American society, when political battles are waged on battlefields far removed from the people affected by federal immigration policies, Pendleton and the visitation team bring no partisan motive to the Dover jail. Their presence promotes no agenda other than a pragmatic compassion rooted in their Christian faith. “The Christian message is a rather redundant message of love and forgiveness,” Pendleton said. The visitors’ assistance is welcomed by supervisors at the Strafford County jail in Dover, one of more than 200 prisons and jails across the country to hold detainees for U.S. Immigration and Customs Enforcement, or ICE, part of the Department of Homeland Security. As the only such facility in New Hampshire, the Dover jail’s immigrant detainee population has increased dramatically in recent years, starting during the Obama administration, when the average daily number of immigrant detainees jumped from 30 in 2015 to 80 in 2016, according to a Concord Monitor report. Episcopalians interested in joining visitation programs or starting their own can find contacts and resources online from Freedom for Immigrants, a California-based nonprofit that tracks and supports such programs. This year, under President Donald Trump’s “zero tolerance” policy toward illegal immigration, the 495-bed jail has averaged more than 100 people targeted for federal immigration enforcement. Some are awaiting trial or serving sentences in unrelated criminal cases, but many of the immigrants are being held for no other reason than ICE suspects they are not in the country legally. They may only spend a brief time at the jail before ICE determines their next steps and moves them elsewhere, typically without revealing those moves to jail officials or the visitation team. 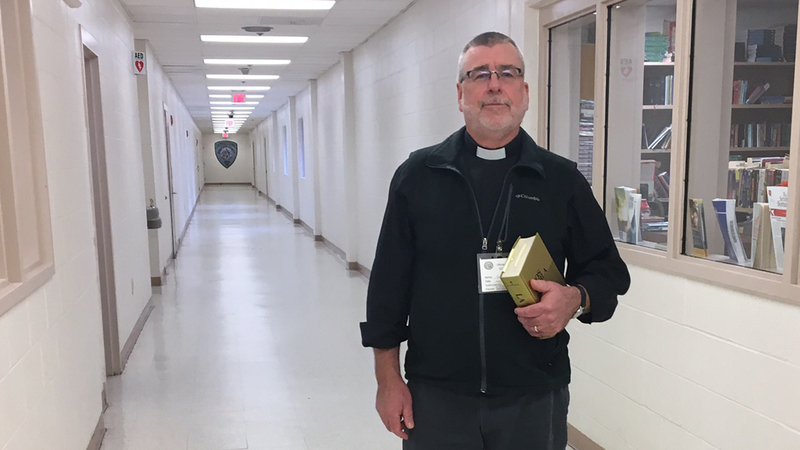 Episcopal News Service was granted access to the jail’s inmate housing units and meeting rooms to report on the work of the New Hampshire Immigrant Visitation Program, as well as Pendleton’s pastoral care for detainees who request it. ENS, escorted by a jail superintendent, spent much of the morning Nov. 5 shadowing Pendleton and four other volunteers to capture the substance of their interactions with immigrant detainees. To minimize the risk that these normally one-on-one conversations would be hindered by the additional presence of a reporter and jail supervisor, ENS refrained from asking questions of the detainees themselves. ENS also agreed to requests from the jail and the visitation team not to quote detainees directly or by name. The outlines of their stories, however, offer examples of what the visitation team members say are typical scenarios facing the detainees, some of whom are clinging to hope against long odds. The volunteers provide the detainees with general information and guidance about aspects of the immigration system, from applying for asylum to voluntarily leaving the country, though the team is necessarily clear about not being able to provide legal advice. They aren’t attorneys. Pape created the visitation program about six years ago with Maggie Fogarty, a New Hampshire official with the Quaker organization American Friends Service Committee. Pendleton, rector at Christ Episcopal Church in Exeter, joined the team two years ago, drawn partly by the prospect of putting his knowledge of Spanish to use. Though not officially a faith-based ministry, volunteers often bring a Christian perspective to the work. This Monday, they were joined by two other volunteers, Judith Cole and Sally Fleming. The group signed in around 8:20 a.m. and made its way through a pair of secure doors. Each opened and closed with a mechanical “CHACK-buzz-CHACK” facilitated by some invisible Oz on the other end of the intercom buttons. Down a flight of stairs, through more imposing doors, Jake Collins, the jail’s assistant superintendent for programs, led the way through a maze of halls that he said was designed to maintain an element of mystery. If an inmate somehow were to escape through one of the doors, the next step toward freedom wouldn’t be obvious. The detainees are not required to meet with the visitation team. As the volunteers move among housing pods, jail officers make announcements to the units to invite immigrants to come forward if they’d like the assistance. The number of detainees who accept the invitations varies week to week, sometimes depending on how active ICE has been in making arrests over the weekend. Immigrant detainees are most likely to be in their late 20s or early 30s, and 70 percent are jailed on immigration violations for a month or less, according to national statistics kept by Freedom for Immigrants, a California-based nonprofit aimed at ending immigrant detention. Mexico is the detainees’ most common home country, followed by El Salvador, Honduras and Guatemala, three countries facing high rates of forced displacement by violence. The Dover jail mirrors those trends. Certain Spanish words ring with regularity in the conversations between the detainees and the visitation team. Asking a detainee’s “país,” or country, is one of Pendleton’s icebreaker questions. He received his call to ordained ministry while in Colombia and has been to many of the immigrants’ home countries, allowing him to establish a rudimentary rapport with them in the jail. He and the other volunteers also ask how the detainees entered the United States, and whether they re-entered after a previous deportation, which can complicate the detainees’ efforts to remain in this country. “Tienes un abogado?” Do you have an attorney? Without one, a detainee’s long odds become even longer, and there are few lawyers willing to take on immigration cases pro bono unless they see a reasonable chance for success, Pendleton said. After navigating the hallways and ending up deep inside the facility, the visitation team’s first stop was Housing Pod 1, or HP1 in the jail’s shorthand. Inmates here are assigned to one of several units arranged in an octagon around a raised guard station, from which officers can monitor the inmates’ activity. Units A and B are for female inmates. Unit D is maximum security, for disciplinary cases. Unit E is for inmates with special management needs, such as physical disabilities or court orders that prohibit contact with codefendants. Unit F is intake, for newly arrived inmates as they are evaluated for housing assignments. Unit C is divided in half, and on one side of a cinderblock dividing wall are the non-criminal ICE detainees, the only inmates who wear jail-issued maroon. Strafford County does little else to differentiate them from the general jail population. Like all inmates housed in Dover, “we try to treat them as fairly and humanely as possible,” Collins said. On this day, Collins estimated Unit C held about 50 detainees in maroon clothes. As he spoke, he buzzed one man back into the unit to retrieve paperwork. The visitation team began setting up in a sparse meeting room, its off-white walls rising from a trapezoidal floor plan. Fluorescent bulbs radiated light down to the tile floor. Reinforced windows afforded views out to an equally sparse hallway and to an adjoining conference room. In the middle of the room, folding tables were arranged into a square. On one side of the square, Pendleton was speaking in Spanish with an immigrant about his case. Another man was with Fogarty researching an asylum application. Cole, with Pape translating, worked with a third man, who said he was from Nashua, New Hampshire, and wanted to apply for release on bond. Winning release doesn’t guarantee a win on the underlying immigration matter, but mounting a defense is more productive on the outside, in addition to being more comfortable. Immigrants in some cases ask to leave the United States immediately and voluntarily rather than sit in jail indefinitely, Pendleton said. 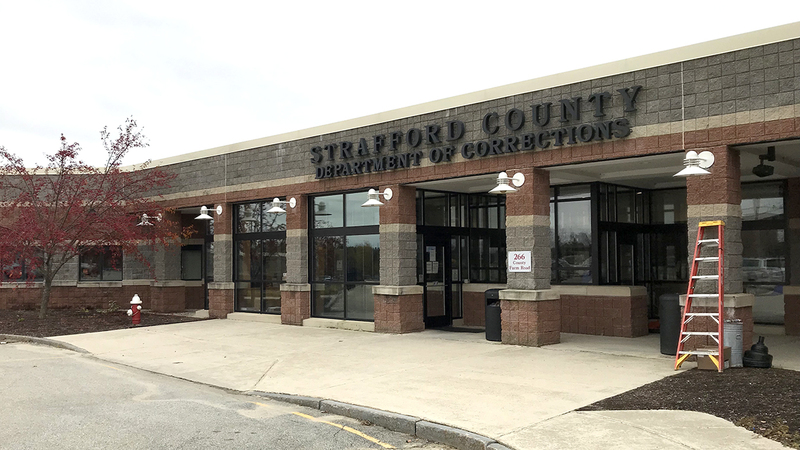 ICE pays $83 a day to Strafford County for each federal detainee held in the Dover jail, and in 2017 those payments totaled nearly $2.8 million, according to the Concord Monitor. The jail, which first began housing ICE detainees in 2009, must pass rigorous federal inspections that check the facility on more than 600 standards, from the temperature of its dishwashers to the labels on its cleaning spray bottles. ICE also must OK the visitation program and its schedule before the volunteers, who receive agency-approved training, are allowed to meet with the detainees. The jail has worked to accommodate the team’s interest in serving these inmates. “If somebody can find something and help these guys out with their case, we encourage it,” Collins said. 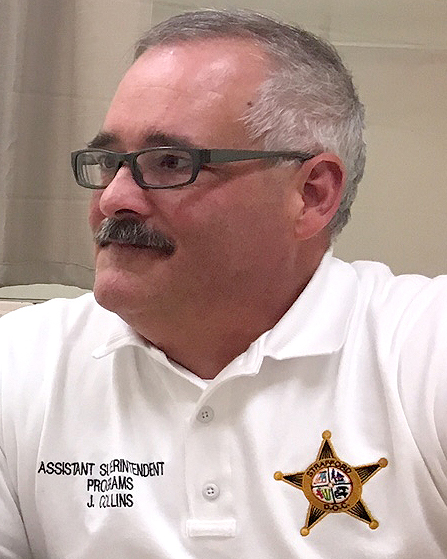 As the group wrapped up its visits with Unit C detainees, Pape moved to a different housing pod to offer assistance to immigrants being held in Unit G, where 72 inmates are monitored by a jail officer stationed behind a desk on the unit’s floor. Instead of maroon, these inmates wear brown to indicate they have active criminal cases pending. The unit is considered high-medium security. Inmates here have a range of amenities, including TVs, laundry facilities, showers and a simple workout area. The jail no longer accepts physical mail addressed to inmates, for security reasons, but each is assigned a durable tablet for receiving email. Pape set up in a meeting room not much different from the first – this time a rectangular floor plan, but the same off-white walls, overhead fluorescent lights, reinforced windows, tile floor. 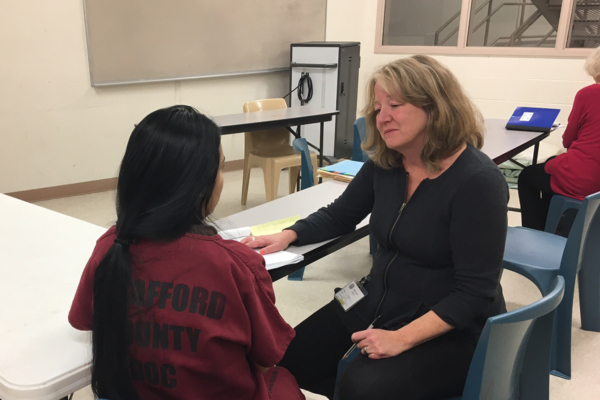 She put her files on a folding table and began talking with an immigrant in a brown jail shirt. He wanted help with paperwork for a child custody case, and handing Pape his jail-issued tablet, he showed her a picture of his girlfriend and their son, who also live in New Hampshire. He has another child in the United States, which is why he re-entered after being deported several times to his native Honduras, Pape said. Because of the re-entries, he was charged with an aggravated felony. “For the general public, you’re thinking something really dangerous, and this is just a case of him wanting to return to his children,” Pape said. Initially he was joined by three men, who said they were from Somalia, Guatemala and El Salvador. A fourth entered behind them. “De qué país?” The late arrival said he was from Mexico. Pendleton first met with the man from Somalia, who had injured his legs in the jail and was seated in a wheelchair. He told Pendleton he had hoped to join a group of other Somali detainees who were sent back to their home country earlier in the year, and he wasn’t sure why federal officials left him behind in Dover. Pendleton said the visitation team would look into it. “You’ll be here next week, chances are, so I’ll update the team,” he said. Next, the man from El Salvador explained his situation, saying in Spanish that he had entered the United States in 2012 after a previous deportation. “Abogado?” Pendleton asked. No, the man said, but his wife and daughter live nearby. After asking the man how he felt about his case, Pendleton acknowledged it was “un poco complicado,” a little complicated, because of the re-entry. Pendleton took notes so the team could follow up next week. New Hampshire may seem a surprising locale for such conversations, with much of the national focus turned to immigration enforcement along the United States’ southern border. Texas, California and Arizona are the states with the largest numbers of immigrant detainees, each state averaging thousands each day, according to Freedom for Immigrants, which maintains a national network of affiliated visitation programs at 55 prisons and jails like the one in Dover. An estimated 11 million unauthorized immigrants lived in the United States as of 2014, but only 10,000 were in New Hampshire, according to Pew Research Center, out of a statewide population of 1.3 million. Yet New England has become a regional flashpoint in the immigration debate. Immigrants here, legally or not, typically have moved north into the region in search of work or to join family, or they have crossed the border south from Canada, Pendleton said. 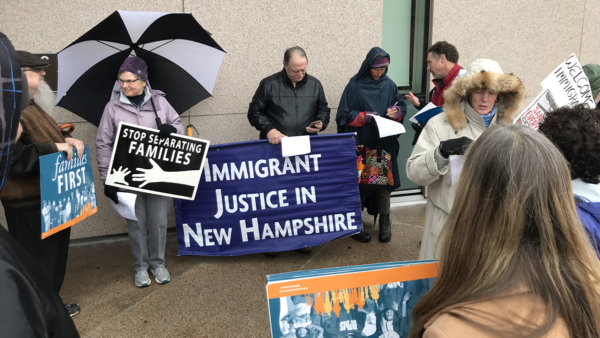 Several faith-based groups, including the New Hampshire Council of Churches, have held regular vigils outside the federal building in Manchester because immigrants have been told to show up there with increased frequency for ICE check-ins. Some arrive fearing they will be told on the spot to buy an airline ticket to their native country and leave any family members behind, Fogarty said. The groups also organized a Solidarity Walk for Immigrant Justice in August, walking the 40 miles from Manchester to the jail in Dover over four days to raise awareness of the immigrants’ plight and to show support for them and their families. Immigrants, including those facing deportation, also have the support of the Episcopal Church, which in July passed multiple resolutions on immigration issues at its 79th General Convention in Austin, Texas. About 40 people joined the prayer vigil Nov. 6 outside the Norris Cotton Federal Building in Manchester on a drizzly, overcast Election Day morning. Some participants ministered to the immigrants who arrived for their check-ins throughout the morning, while the rest of group joined a Jericho walk, seven times around the building in silence. “I know that no matter which party is in power, we have lots of creative work to be done,” the Rev. Gayle Murphy, a United Church of Christ pastor, told the participants before the walk. A day earlier, in the Dover jail, Pendleton explained how “difícil,” or difficult, some cases are that he reviews. “Some of these folks are just headed for deportation,” he told ENS. Sometimes, all they have left is hope. When it was the Mexican man’s turn, Pendleton asked his hometown and learned the man was from Vera Cruz. “Mucho calor” – very hot – Pendleton said, trying to break the ice. The young man smiled through a light beard, but his smile didn’t last long. He told Pendleton that he had been living in Danbury, Connecticut, with his family when he was arrested on a traffic violation. That traffic stop revealed he had re-entered the U.S. after a previous deportation. Not impossible to fight deportation, no, but Pendleton offered the man a photocopy labeled “Voluntary Departure Guide” in case he wanted to take that route instead. “No pierdas esperanza,” he said finally. Don’t lose hope. Pendleton’s last task of the morning was to meet with immigrants who had requested pastoral visits from him. For this, he slipped his white clergy collar into the neck of his black shirt and gave Collins a sticky note with the names. Collins said he would bring one of the inmates on Pendleton’s list into Interview Room S-1, but “the other guy went out this morning,” he said, referring to another inmate on the list who had been taken from the jail by ICE. S-1 was even smaller than the other meeting rooms, about 8-feet squared. Off-white walls. Overhead fluorescents. Reinforced windows. Laminate wood floor. Pendleton placed his Bible on the room’s folding table and took from his folder sheets of paper containing excerpted Bible passages in English and Spanish. Collins brought in an inmate who said he originally was from Costa Rica, and as the man sat down across from Pendleton the conversation alternated between languages. “Your English is good,” Pendleton complimented. The Costa Rican man has lived in the United States for 18 years, and, despite losing his right forefinger in a childhood injury, had been able to find work on a dairy farm in Vermont. He and his wife, who is from Argentina, have three teenage children, all born here. They are churchgoers, he said, and although he wasn’t sure the denomination, Pendleton guessed Episcopal by the man’s description of the church – kind of like a Catholic church, but with a female pastor. The man had been in the jail for a month and wore a green shirt, which Collins had said earlier indicates an inmate serving a criminal sentence, though the man’s crime wasn’t clear. Pendleton remarked that the man seemed upbeat and cheerful despite his difficult circumstances. “Tú lees la Biblia?” Do you read the Bible? The man said he did, and the two of them took turns reading out loud the Spanish passages on Pendleton’s sheets: Isaías 41:10, Salmos 145 and 2 Corintios 4. “Nos derriban, pero no nos destruyen,” St. Paul says in his second letter to the Corinthians. “Es la verdad, no?” Pendleton asked. The man agreed, very true. They concluded the pastoral visit by reading the Prayer of St. Francis and the Lord’s Prayer together in Spanish. Their words were still ringing in the air as Pendleton shook the man’s hand and returned him to Collins in the hall.